It’s no surprise that Stanford University’s medical expertise includes the ability to identify malignant skin lesions or any other skin disease from an image of an affected patch of skin, as well as to specify risk factors for any of those diseases. What may be surprising is that it’s a computer, not a human, doing the identifying. Stanford’s skin-diagnosing software builds on software developed at Google, and was trained on 130,000 images of skin disease in a process that imitates the way human experts learn. The system matches the accuracy rate of dermatologists, and the Stanford research team behind it is looking to commercialize the research by turning it into a smartphone app for consumers. Artificial intelligence (AI) seems poised to transform healthcare. Machine-learning systems can take vast amounts of health data and interpret them to make diagnoses, and do it faster than any human could. It’s not just U.S. healthcare that will be impacted. Internationally, the AI market is set to expand rapidly. Research from Frost & Sullivan predicts global revenue from AI-related health systems will rise to US$6.7 billion by 2021, up from just US$811 million in 2015. And Asian researchers and technology companies, especially in China, are aggressively moving into the field. Developing the systems that power artificial intelligence requires correlating thousands of variables spanning patient medical data — including disease progress and subjective measures such as pain, fatigue, mood, behavioral patterns and allergies — and then developing software that can identify related trends among these variables and predict medical outcomes. In China, that leads to a challenge: there’s a dearth of easily accessible healthcare data, because many Chinese healthcare systems have not yet been brought online, and electronic health record systems are few and far between. But some Chinese entrepreneurs are reframing these problems as opportunities. Jun Wang, founder of the biotech company iCarbonX, is developing an AI-influenced consumer app that will provide customized health and medical advice based on a customer’s DNA, health habits and environment; information that can be more easily obtained than medical records. The company has raised US$600 million for the effort, including about US$150 million from Shenzhen-based Tencent Holdings, which owns China’s social messaging app WeChat. Wang pointed to the popularity of WeChat — over 768 million users as of last September — as evidence that Chinese consumers are open to sharing information online. He said he’s confident that he’ll be able to build a database of DNA samples from over one million people within five years. iCarbonX isn’t attempting this alone. Wang has established an alliance with healthcare data companies from around the world to provide expertise in mining medical and biological data. They include the U.S. companies SomaLogic (Colorado), HealthTell (California) and PatientsLikeMe (Massachusetts). By integrating their different platforms, iCarbonX envisions being able to aggregate and analyze patient healthcare information — including genomic information — quickly and cheaply. iCarbonX isn’t the only company in China making inroads into medical artificial intelligence technology. The voice-tech company iFlytek, a giant in China in the field of speech recognition technology, has adapted iFlytek’s successful “two-stream model system” to detect and learn languages beyond Chinese, including Japanese, Korean, French, Spanish and Russian. 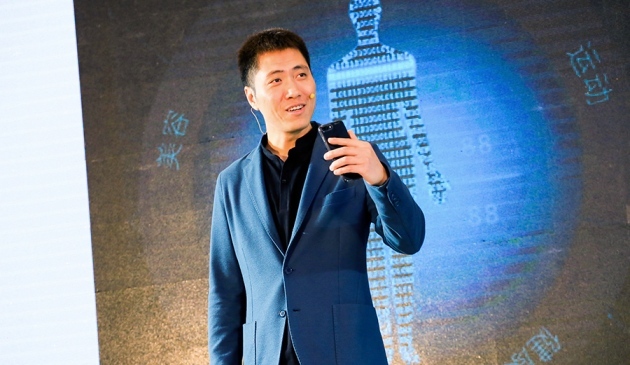 iFlytek chairman Liu Qingfeng recently said that the technology will be further developed to comprehend and think about speech in addition to its current capabilities of listening and speaking — features that could be incorporated into mHealth applications or used by healthcare providers who cannot directly communicate with their patients. And CloudMinds Inc., a Chinese AI startup, raised US$100 million in February 2017, to advance its cloud-based AI system with applications that include helping blind people navigate street travel. And yet another technology platform, called “Ningbo Cloud Hospital” and established in 2015, is using cloud computing to create a virtual hospital for the Chinese port city of Ningbo. Its services include collecting and analyzing data for hospitals, pharmacies and insurance companies, and providing health education and diagnostic services for remote clients. These Chinese startup efforts — along with projects by the huge Chinese technology players Baidu (which has built a mobile app for virtual consultations with physicians), Alibaba (which is working to create an internet pharmacy hub) and Tencent (which is investing in mHealth startups as well as iCarbonX) — have institutional support from the Chinese government. AI technology has gotten a nod from the Chinese Premier Li Keqiang, who has emerged as a vocal advocate of policies that would accelerate the country’s adoption of AI solutions. Ultimately, though, these companies will be competing for global AI market share with established powerhouses. One of them is Google, which started DeepMind Health to incorporate AI solutions into healthcare delivery and has initially partnered with the U.K.’s national health service to give clinicians technical expertise and support to administer better care. Another is Apple, which is capitalizing on the increasing popularity of digital health solutions by creating healthcare apps that allow patients to manage chronic diseases, access their health record information more easily and communicate more efficiently with healthcare providers. China and its global competitors still have to grapple with unresolved questions around regulating the development and use of swiftly evolving technology absorbing personal health data and dispensing advice, often without much human oversight. Legal experts note that regulatory bodies will need to evaluate AI technologies to ensure the systems are secure and that they can be watched carefully by physicians and other experts to avoid errors and misuses. Some applications of artificial intelligence will challenge existing thinking around copyright, intellectual property and patent law. What’s more, regulators will need to work out the liability issues that may arise when AI systems cause problems or make mistakes.